Written for both new and existing businesses, this book introduces you to business on the Internet. It shows you how to create your own Web site, conduct e-commerce, attract customers and get paid. Take a look at why e-commerce is so important today. Learn about Electronic Data Interchange (EDI) which is involved in Business to Business (B2B) relationships and e-tailing in the Business to Consumer (B2C) area. Examine the shift to broadband connections and why it's so important. Learn about what's involved with Web hosting. Take a look at Web authoring software which will help you set up your own Web site and then find out how to make your site user-friendly. Find out how to conduct e-commerce and read reviews of software which will permit your shoppers to order online from you and then pay you. Take a look at the phenomenal success of eBay and what's involved in selling through their auctions and in opening an eBay Store. Consider some of the alternatives to eBay. How to use traditional marketing to drive traffic to your site and the co-op advertising program offered by eBay to its Powersellers. You will find out how to plan for e-commerce and what it's going to cost. Take a trip into the future and find out why e-commerce will be so important for the survival of your business in the years to come. Get all the information you need to get started by using e-business to expand your business! Introduction - What is E-Commerce? Chapter 1 - What is Web Marketing? Chapter 3 - How Much Business Is Being Done Over the Web? Chapter 18 - What's It Going to Cost? 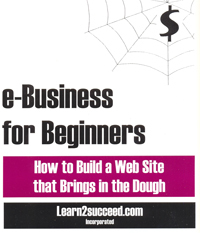 e-Business for Beginners: How to Build a Web Site that Brings in the Dough by: Learn2succeed.com Incorporated: softcover; 184 pages; ISBN: 978-1-55270-280-2; published in 2007; $29.95.